Our cruise across the Baltic Sea had been successful and it was time to make landfall in yet another northern nation: Sweden! The rooms weren't anything opulent but they got the job done. I had a pretty good time. Really after every cruise we take from now on we'll probably say "well that wasn't as bad as that Carnival Cruise". Kalle Anka, or Donald Duck, is a big deal in Sweden. According to Atlas Obscura, every "year since 1959, at 3 p.m. on Christmas Eve, the 1958 special Kalle Anka och hans vänner önskar God Jul (Donald Duck and His Friends Wish You a Merry Christmas, in English) is screened on Sweden’s main public television channel, TV1." "Swedes are so compelled by the cartoon that last year during the program, cell data usage fell 28 percent and calls to emergency services dropped 16 percent, reports the Local." If my calculations are correct... if they just showed Donald Duck on TV 24/7 then Sweden's crime rate would drop to zero. Our first order of business in Sweden was to find a laundromat. They are apparently almost non-existent in Sweden. My theory is that they have a much more egalitarian society and so everyone just has their own washer and dryer. The lady who owned the place was really funny. I was trying to make small talk with her and she would engage but in a very surly manner. 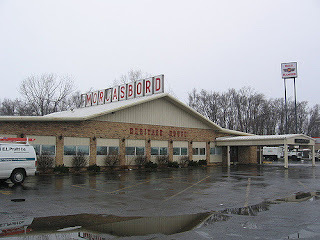 It wasn't so much a laundromat as a room full of machines with a mean lady standing next to them demanding cash in her hand before she'd let you use them. I said something like "oh it's interesting that laundromats are so rare" and she kept replying "this isn't a laundromat!!" Me in front of the "definitely not laundromat". We are definitely getting our money's worth out of this rental. Lydia and I checked in before my parents' arrival just to smooth their whole settling in process. The aptly named Downtown Camper by Scandic was really cool. It was... camping themed. Lots of wood paneling and humorous signage. I recall the sign on the door to the stairs read "free exercise". We popped over to the airport to collect Mom and Tom. Thankfully they weren't too pooped from their journey because things were about to get real. Time was of the essence because Lydia and John trips are full of wonders. Also it was hot and they fell for the "northern Europe is cold" meme that's been going around and brought mostly cold weather clothes. The world was now their sauna. We headed back to the hotel to drop off their stuff. They were impressed by the wooden ping pong table with the leather net. You know, the kind you use when you're camping. First thing's first. Swedish fish. 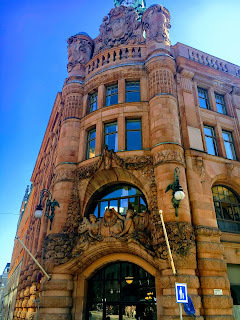 The first touristy locale we hit as a group of four was the Nobel Museum. Admission was half off because it was so hot. I overheard someone saying this was like the hottest day in Stockholm ever or something like that. One fun fact that I learned is that the Nobel Peace Prize is awarded in Oslo, Norway and the Nobel Prizes in Physics, Chemistry, Physiology or Medicine and Literature and the Prize in Economic Sciences are awarded in Stockholm, Sweden. When a prize is awarded they ask the winner to donate something related to the win to the museum. There were a lot of cool artifacts there as a result. I asked them to show me to the Trump peace prize exhibit, but they must not have it set up yet. Low energy. Our guide joked that Nobel Prize winners get the prize, one million dollars, a handshake with the King of Sweden, free admission to the museum and 10% off at the gift shop. We sat and watched clips about a few of the winning ideas in a little theatre. The Bubble Chamber was closed due to water damage. I did not see that coming. This is like the cutest way to describe a mugging ever. They had some very odd phone booths. We checked out the grounds of the Royal Palace. I noticed a decent amount of these cool sculptures blocking off different roads. I thought they were classy but didn't think much more about it until I later read that in 2017 Stockholm had one of those truck terrorist attacks. We somehow ended up underground in the museum in the Royal Armory reviewing a parade of royal coaches. They were really cool. The type of crown on top of the coach told you which fancy-pants would've been riding within. "Marie Antoinette's pen, inkwell and etui, 1760-80. Inkwell of oriental lacquer and gold. The golden pen consists of four detachable parts with a nib at one end and a pencil at the other. Wooden etui, covered with green polished lizard leather with red velvet lining. Skokloster Castle"
I guess the Swedish Count Hans Axel von Fersen and the Queen of France Marie Antoinette had a little tryst or two, which is why the belongings of a French lady are sitting in a Swedish museum. I've already seen police shaking down two hobos. Police seem more active here than in our previous countries. While having a rest at a park we could see our next destination across the river: The Grand Hôtel. According to their website "The Grand Hôtel in Stockholm has been home to celebrities, high-profile events and everyday bon-vivants since 1874." "Everyday Bon-Vivant" is going on my business cards. Probably second in trashiness to my love of international McDonald's is my ongoing search for new and exciting Fanta flavors. Why were we entering the rarified air of the hotel that hosted the very first Nobel prize winner banquet in 1901? Swedish. Smorgasbord. 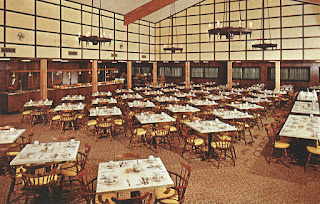 "The Veranda offers a smörgåsbord with all the trimmings – from herring dishes and gravlax to meatballs with lingonberry jam. With it, make sure to try our very own snaps, 1874 Grand Aquavit, spiced with caraway, anise and fennel." It was nice to finally have a giant Scandinavian fish buffet because I hadn't had a giant Scandinavian fish buffet since yesterday. I was effectively giant Scandinavian fish buffet starving to death. 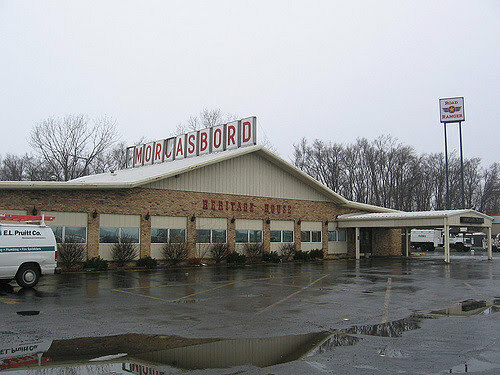 It's funny my grandparents used to like to eat at this trucker buffet by the highway in Springfield, Illinois when I was a kid and it was called Heritage House Smorgasbord. 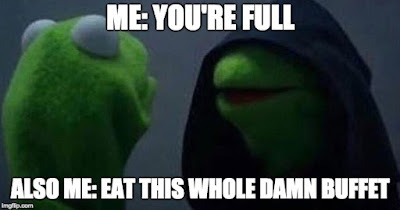 So I've long acquainted that word with stuffing my face. 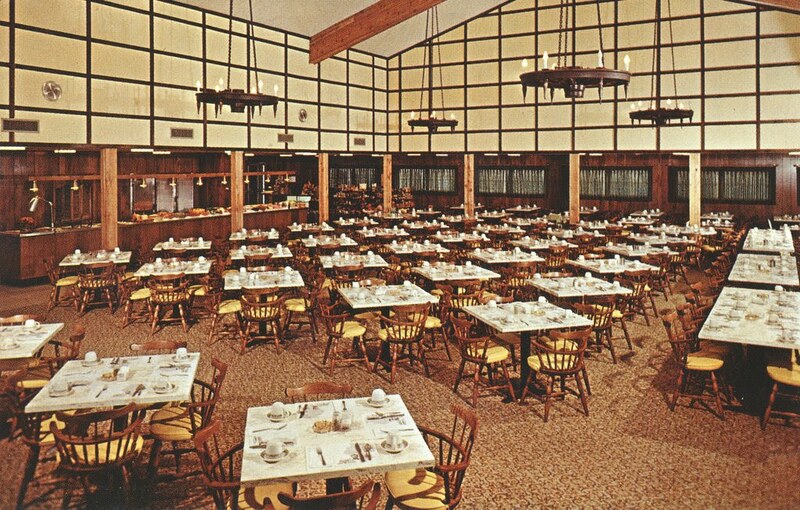 I recall a dinner at Heritage House was the first time that I ever ate bread pudding. So exotic. The Swedish smörgåsbord is our national gastronomic pride. Everything on the Veranda's smörgåsbord does look irresistible, but try to be selective in order to discover the true pleasure of this unique eating experience. We would like to guide you to the best way to enjoy the delicious smörgåsbord the Veranda. Brännvin is a liquor made of agricultural products and it's often flavoured with spices. Brännvin is an old designation for the Latin word "aqua vitae", and dates back to 1467. The Swedish word snaps has been borrowed from the German word Schnaps, meaning "mouthful" or "sudden, fast movement". A staple on the smörgåsbord is the herring, with which a Swedish snaps is a must. What, then, could be better than the Grand Hôtel's own 1874 Grand Aquavit, which was produced for the hotel's 125th anniversary in 1999. This homemade aquavit is generally flavoured with caraway, aniseed, fennel, and a dash of sherry, which creates an especially smooth, full and balanced taste. Skål! (Cheers!) an old word from the time when our ancestors were drinking Brännvin from a bowl. The Swedish word for bowl is "skål". "Enjoy! Think of the Swedish smörgåsbord as a four-to-six course meal. Do not overload your plate. Make several trips to the buffet instead and take a fresh plate each time. Begin with the herring dishes traditionally accompanied with hot potatoes. Together with the herring, try a slice of sharp Swedish cheese, crisp bread and a shot of aquavit chased with cold Scandinavian beer. Next, sample the fish dishes and try the Swedish speciality, "gravlax" marinated salmon, don't forget the mustard sauce with dill. Try the smoked salmon with a squeeze of lemon. Then we suggest a variety of salads, egg dishes and cold cuts of meat and poultry. Now take your pick of the hot dishes - and remember to take lingonberries with your homemade meatballs. And finally, enjoy one of our famous desserts - the fruit salad is always delicious. Why not complete the smörgåsbord by having a strong cup of coffee together with chilled traditional digestive - "Punsch"?" I thought that the guidebook did an artful job of informing as well as selling us drinks. I really liked our waiter. I was really excited about this meal and I believe I conveyed that to him with my questions because he put a lot of care into showing us how to manage this massive array of deliciousness. I want to say he was Chilean. Our awesome waiter said we had to make at least eight trips to the food line. "When I finish eating all of the fish, I start back at the beginning." Mom was scared of the majesty of the smörgåsbord and ordered a salad. The whole room was sad. When I was done hurting myself they wheeled me to the curb in a wheelbarrow and dumped me in the street. I deserved it. Stockholm is a nice place.